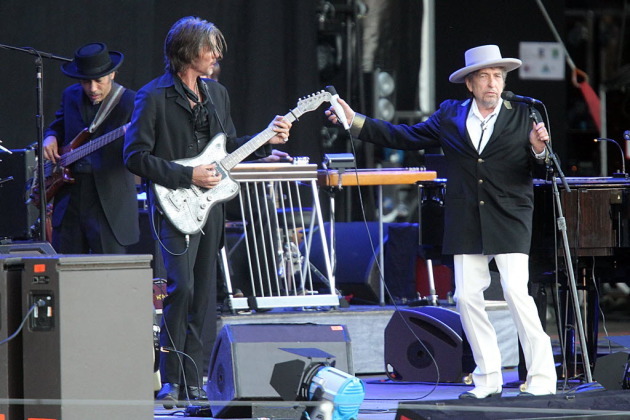 The evening rush hour in St. Paul's Midway area is likely to be more crammed than usual as 12,000 people make their way to Midway Stadium for Bob Dylan's Americanarama concert. Show time is 5:30 p.m., which is right smack dab in the middle of rush hour when Snelling Avenue is already a parking lot. And many fans will be arriving early to snag parking spots along Energy Park Drive and in nearby lots. Tonight might be the night to take an alternate route home, if possible. Look for streets such as Como Avenue, Energy Park Drive and Pierce Butler Route to see extra vehicles this evening. Concertgoers can take the free shuttles, which will be departing from the State Fairgrounds’ Lot 55 on Como Avenue just west of Snelling by the big Cattle Barn. The shuttles will start at 4 p.m. and go until midnight. If your commute normally takes you on Snelling Avenue, I'd recommend using Hwy. 280 to the west or Lexington Avenue or Dale Street to avoid the anticipated tangle. Concertgoers, and anybody else out after 10 p.m., will find that northbound I-35W will be closed between the downtown exits (Hwy. 65) and Park Avenue. The ramp from 5th Avenue to 35W also will be closed. That ramp also is known as the Franklin Avenue ramp. The closure will be in place from 10 p.m. to 5 a.m. Thursday. Traffic will be detoured to westbound I-94 to eastbound 694. That might not be the fastest way to get east. The detour will take drivers right through the work zone on 694 where the freeway will be down to a single lane from Hwy. 252 over to University Avenue. In this case, it might be quicker and easier to get off on 5th Avenue, go through downtown to Washington Avenue, then turn right and get back onto northbound 35W. The closure is necessary to allow crews to work on the Park and Portland Avenue bridges.